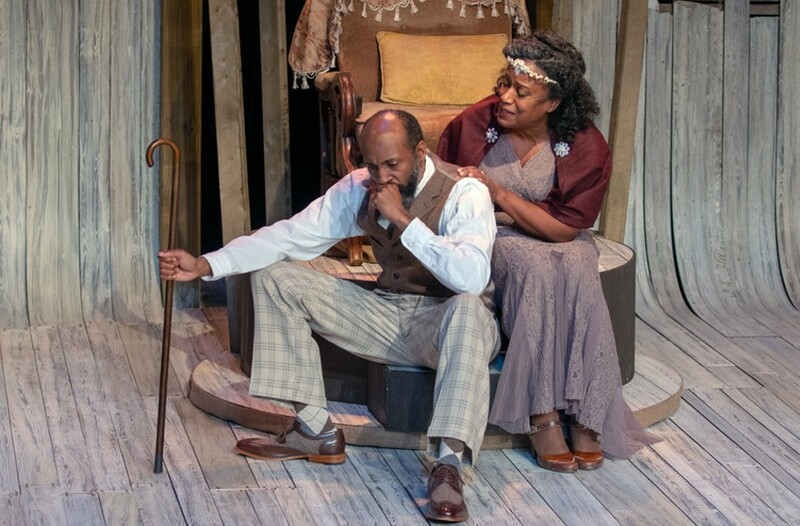 Firehouse Theatre's “Oedipus: a Gospel Myth” delivers powerful performances | Theater | Style Weekly - Richmond, VA local news, arts, and events. Bill Sigafoos D.L. Hopkins as Oedipus and Patricia Alli portrays Jocasta, Oedipus’ wife. What do Greek tragedy and gospel choirs have in common? A lot, it turns out. Both feature powerful oration, an onstage chorus commenting and responding, and audience participation, to name a few. In his new production "Oedipus: s Gospel Myth," currently running at Firehouse Theatre, director Vinnie Gonzalez uses these similarities as his guide in crafting a smart, surprising update of Sophocles' classic tragedy about a king who unwittingly fulfills a divine prophecy by killing his father and marrying his mother. This re-imagining of "Oedipus Rex" is set in a version of Thebes that resembles a Southern gospel church in early 20th-century America. This production is a part of the Acts of Faith Theater Festival, and indeed the juxtaposition of tragedy and gospel elements highlights the theme of faith that runs through the story — faith in God or the gods, faith in divine oracles and prophecies, and faith in our own choices and identities. The production is led by a charismatic preacher, played by Jeremy V. Morris, who is so good it feels as if he was made for this particular mash-up of genres. His character keeps the show running, along with Michael Jones' musical accompaniment and the gospel Greek chorus, which helps to keep up the pace. The three chorus members, Shalandis Wheeler Smith, Shalimar Hickman and Shantell Dunnaville have beautiful voices, and their onstage reactions add to the drama as the story unfolds. D.L. Hopkins successfully navigates long, winding monologues as Oedipus, fully embodying both his hubris and his anguish to cathartic ends. Patricia Alli is wonderful in her tender portrayal of Jocasta, Oedipus' wife. As Teiresias the blind prophet, Toney Q. Cobb is my favorite part of this show, stealing every scene. R.O. Crews' Kreon is kind yet commanding, and Keaton Hillman gives a moving monologue as the servant who describes the offstage violence. Every performance in this show is excellent. The set, designed by Vinnie Gonzalez, is rustic yet regal. The wooden floor slats slope upward into the wall, decorated to look dilapidated, with drywall missing in areas so the foundational slats show through, allowing for some cool effects from Steven Koehler's lighting design. The throne, positioned at the center of the stage, turns away from the audience at times, with wooden spikes jutting out resembling weapons or rays of light. Niomi Kaiser's costume design is conceptually perfect, as well. She dresses most characters in clothing that seems appropriate to the modern time — dapper suits in muted colors, with pocket watch chains. The gospel Greek chorus wears costumes that look like a perfect cross between Greek togas and gospel choir robes. This production is snappy for "Oedipus Rex," but it is still a Greek tragedy. It feels long and dramatic and talky because it is long and dramatic and talky. It's an excellent show, though, with some truly impressive performances, a special way to experience a classic. Firehouse Theatre's "Oedipus: a Gospel Myth" runs until Feb. 23. Tickets cost $35. firehousetheatre.org.